We are pleased to announce that firewall and reboot functions are now supported in all three Azure Redis Cache tiers. We have been making these previously premium-only features available to the basic and standard tiers at no additional cost. In addition, we are previewing the ability to pin your Redis instance to specific Availability Zone-enabled Azure regions. Firewall provides added security for your Azure Redis deployment. It lets you restrict which clients can connect to your Redis cache based on their IP addresses. You can create a firewall rule for each IP address range that your Redis clients use. Once you enable firewall, by specifying at least one rule only those requests coming from IP addresses that fall into the defined IP range(s) will be accepted by Redis. Redis monitoring endpoints are excluded from firewall rules, however. This prevents accidental network disconnect due to firewall settings and ensures that monitoring will work uninterrupted. Reboot allows you to restart one or more nodes in your Redis Cache. This function is useful particularly for simulating cache failures and testing how your application would react to them. It is a highly requested feature from User Voice. 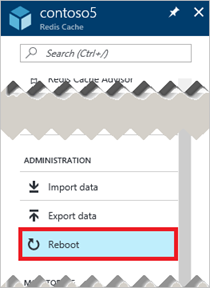 You can reboot any cache node using the Reboot blade in the Azure Portal or this PowerShell command. Please keep in mind that you may lose data due to a reboot and the amount of loss depends on which node(s) you are rebooting. The Reboot FAQ documents this and other issues you would want to be aware of. Zonal pinning gives you the ability to control where your cache instance is placed within an Azure region that is consisted of multiple Availability Zones, which protect you from datacenter-level failures. By pinning your cache to a specific zone, you can make sure that your application and cache are located closely together. This feature is currently in public preview (as are Availability Zones) and is supported on Premium Redis caches. You can try out zonal pinning by following this set of instructions after you have enabled your Azure subscription for zone support. If you have any question or feedback, please contact us at AzureCache@microsoft.com.